After outrage on social media and elsewhere on Friday, the government moved to clarify that the order is not new and it merely reiterates the powers that were already available to these agencies since 2009. “No new powers have been conferred to any of the security or law enforcement agencies,” the government noted in a statement. 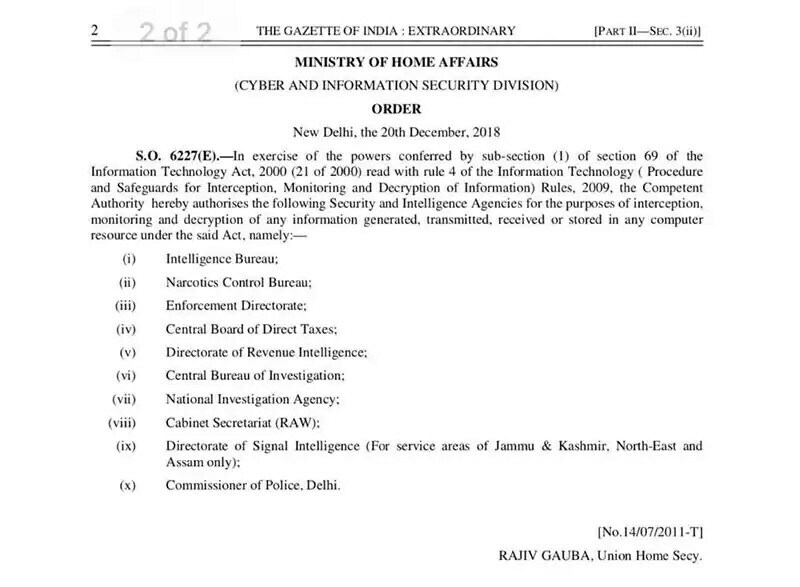 It also stated that all requests to monitor, intercept, and decrypt any computer’s data have to be approved by the competent authority. The Union Home Secretary is such an authority for the central government and the Chief Secretary for the state government. Signed by Home Secretary Rajiv Gauba, the order not just allows these agencies to track your digital life but also mandates full cooperation from the citizens to help the agencies access your data. According to the notification, the subscriber or service provider or any person in charge of the computer resource is bound to extend all facilities and technical assistance to the agencies. Failing this, they can face seven years in jail and a fine. The new order greatly expands the powers of these agencies, which were earlier only allowed to intercept calls or data. Essentially, the government agencies can now tap your calls, read your online communication, access data stored on your computer whether or not it is connected to the Internet as well as intercept any digital information that you share with others and vice versa. According to a home ministry official, the order extends the powers of the law enforcement agencies to match the needs of the present day. The government order has drawn sharp condemnation from politicians and citizens online. “Why is every Indian being treated like a criminal? This order by a government wanting to snoop on every citizen is unconstitutional and in breach of the telephone tapping guidelines, the Privacy Judgement and the Aadhaar judgement,” CPM leader Sitaram Yechury tweeted. Organisations like the Internet Freedom Foundation have also criticised the order.